Garbage Disposal Repair or Replacement in Chandler, AZ. Like many modern conveniences, you barely think about your garbage disposal until it starts performing badly. Garbage disposals can fail in many ways including incompletely grinding waste, leaking from its seal, developing an unpleasant odor, getting silverware or other objects caught in it, and causing clogs in your drains, just to mention a few. Sometimes it just stops working altogether without a known reason. It is also a kitchen appliance most homeowners are fearful of trying to adjust themselves, the whirling blades rightfully causing great concern of severe damage to finger or hands if you try to fix it without professional help. Garbage Disposal Repair or Replacement in Chandler, AZ. Is what we do. 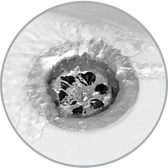 If you are experiencing trouble with your garbage disposal, contact us immediately and we will respond. A highly-qualified technician will arrive at your home to assess the problem. If the disposal hums without grinding up waste it is likely to be overloaded with debris. We will clear the clog, reset the disposal's shut off safety switch to see if that takes care of the problem. If water is leaking beneath your sink we will determine what pipe or connection is causing the issue and fix it if possible. The seal to the disposal will be examined to see if it is cracked or loosened.